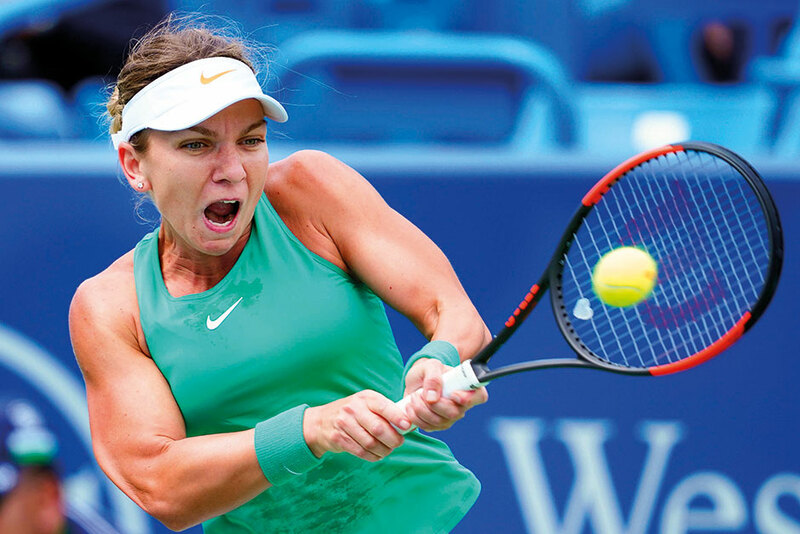 Mason, Ohio: Top seed Simona Halep returned to sew up victory over Ajla Tomljanovic after their second round match at the Cincinnati Open had been suspended the previous day due to rain, while reigning US Open champion Sloane Stephens was knocked out in the third round by Elise Mertens. Stephens, seeded third, fell to the 15th seeded Belgian 7-6, 6-2 and failed to reach the quarter-finals for the third time in her past four events. German fourth seed Angelique Kerber was also upset, going down 2-6, 7-6, 6-4 to American Madison Keys, while Aryna Sabalenka beat sixth seed Caroline Garcia 6-4, 3-6, 7-5. Keys recorded 55 winners to beat Kerber, a rare victory over the German who has come out on top in seven of their nine meetings. “Considering the last — what was it, six times? — it didn’t go so hot, this victory feels good” Keys said. Halep had been two games away from reaching the third round when rain interrupted her match against Australian Tomljanovic on Wednesday, and while the conclusion was delayed again for about four hours on Thursday the Romanian wasted little time wrapping it up when she got the chance, sealing it 4-6, 6-3, 6-3. Halep had been due to play her third-round match on Thursday against another Australian, Ashleigh Barty, but that has been postponed until Friday. Halep owns a 1-0 career record against Barty, with the win coming last week in the semi-finals at Montreal where the French Open champion went on to capture her third title of the season. In the men’s draw, Juan Martin del Potro quickly dispatched South Korean Chung Hyeon 6-2, 6-3 in a second-round match carried over because of inclement weather. Bad weather continued to play havoc with the evening schedule as second seed Roger Federer’s match against Leonardo Mayer and Kevin Anderson’s match against David Goffin failed to get under way. Several of Thursday afternoon’s matches were suspended in progress, with Novak Djokovic leading fifth seed Grigor Dimitrov 2-6, 6-3, 2-1 and Marin Cilic tied with Karen Khachanov at 7-6, 3-6, 1-1. In third round action, big-serving Milos Raonic beat fellow Canadian Denis Shapovalov 7-6, 6-4 while Spanish 13th seed Pablo Carreno Busta topped Dutchman Robin Haase 6-4, 6-2. “I think I got myself into more points on his serve than he did on mine” said Raonic. “It was the thing I struggled with most last time we played, so I definitely made sure to focus on that and sort of try to change that a little bit.” Del Potro and Chung were delayed from taking the court because of rain and then had to endure another weather-related suspension just six minutes into their match. Del Potro was not rattled by the delays, however, and did well to attack Chung’s forehand throughout the 81-minute encounter that determined the final entry into the last 16. “I am happy to beat these young players,” del Potro said. He has a big future, and he is a nice player. I am glad to go through.” This marks Del Potro’s fourth consecutive last-16 appearance in Cincinnati, where the Argentine appears to be in fine form right in time for the US Open.